and the grand lobby at Atlantis The Palm (left). 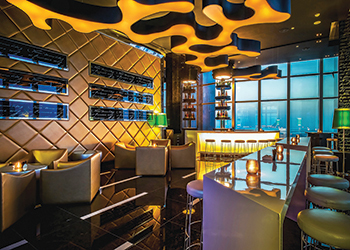 Wilson Associates, a US-based pioneer and trendsetter in the global interior design industry, says unique design is the most critical element of a hospitality project. While every project has its own challenges, the main challenge faced by a designer is not to duplicate any ideas and design, according to Olivier Chavy, president and CEO of Wilson Associates. The Sofitel Dubai ... designed by Wilson Associates. This apart, design firms also face a challenge in attracting the best talent, who in turn must deliver their best, he adds. Wilson Associates, according to Chavy, has been a trendsetter. 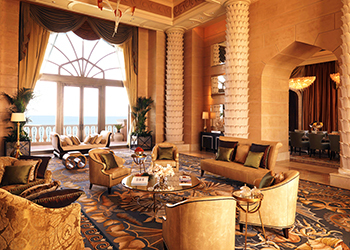 In 1999, the company did the One and Only Royal Mirage and introduced the concept of a resort. The company has been in this region for close to 20 years and set up its regional office in Dubai over a year ago. It also has another office in Abu Dhabi. Wilson Associates has been associated with projects such as the Burj Al Arab in Dubai, Shangri-La properties in Abu Dhabi, Dubai and Oman, Park Hyatt hotels in Dubai and Abu Dhabi, the St Regis Doha in Qatar and the Four Seasons Hotel Cairo in Egypt. “Our strength has always been in understanding the local culture. While designing a five-star hotel in a market like Dubai – which is one of the fastest growing markets in the world – one has to think how to make it a successful retail investment. This is where we are very strong. “Dubai also has to accommodate a large number of international travellers. So, besides showcasing the local flavours, property operators also have to adapt to the needs of international travellers,” he says. 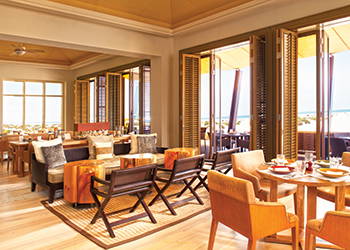 The Park Hyatt in Saadiyat Island. “We are doing some amazing projects from our Dubai office. For example, we are doing a hotel for the Taj Group and the presidential palace in Abu Dhabi. The presidential palace is going to be amazing – there is no other project like it,” he adds. Wilson Associates has worked on several projects across the Middle East but Chavy’s personal favourite is the Park Hyatt on Saadiyat Island in Abu Dhabi. “It belongs to the new generation of Hyatt hotels and sports a great design,” says Chavy. “We have used a lot of different materials like the wave of wood in the lobby ceiling, marble and glass and an unusual colour palette. For example, the library is inspired by Hermes brand colour – orange – which was unusual as one does not see so much use of this colour,” he explains. The Armani at the Burj Khalifa, meanwhile, was challenging because of its construction schedule and also because Wilson Associates was working with the famous designer. 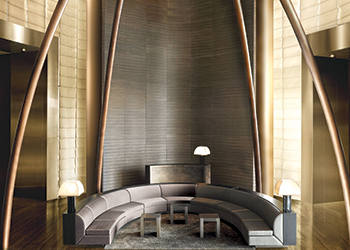 “We had to work behind the scenes as it was an Armani hotel,” he explains. Though the hospitality sector accounts for the bulk of its business, Wilson Associates has been trying to diversify its portfolio, says Chavy, pointing out that the company has done several residential towers in Dubai. It has also worked on retail projects, as well as yachts and airport lounges, he adds. 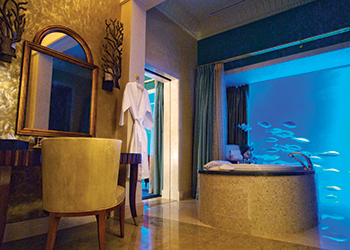 The Lost Chambers Suite bath at Atlantis The Palm. Commenting on current trends in hospitality design, Chavy says: “If we look at room design, it is now more of an open space. Earlier, there used to be three different zones but today there is only one zone with wet and dry areas merged together so one can create their own space. Today, we have windows spanning the floor to the ceiling and across the walls. We find beds facing the windows, whereas earlier they were positioned against walls and facing the TV. Things are changing – one may see a bathtub in the middle of the room in the near future. “It is exciting to be in this industry as you can change the mindset and set a trend,” he continues, adding that Dubai is a vitural “laboratory” for formulating new ideas. The Armani in Dubai ... challenging project. Chavy says that the most critical element of design is good quality. “Sometimes, the developer tries to save the last dime on a piece of décor or on the quality of materials just because he is running out of funds but this can be very critical as customers today are more discerning and one cannot afford to go cheap. In a luxury hotel, one works on stimulating the senses – touch, feel and smell. It is critical not to jeopardise the positioning of a property by compromising on this,” he says. Chavy says that Dubai offers Wilson Associates room for growth. “We have taken this office like an entrepreneur and will grow it as much as the business requires. We also want to retain our identity and to grow only with the right talent. The Middle East is leading the global race in designing truly outstanding architectural landmarks, and we want to continue to be an important part of that story,” he concludes.